Winterwood like you've never seen it. This Winterwood unit is truly one of a kind and unlike anything else in the complex. The interior of this unit was completely re-imagined.The new master suite features a bathroom reminiscent of a 5 star resort. 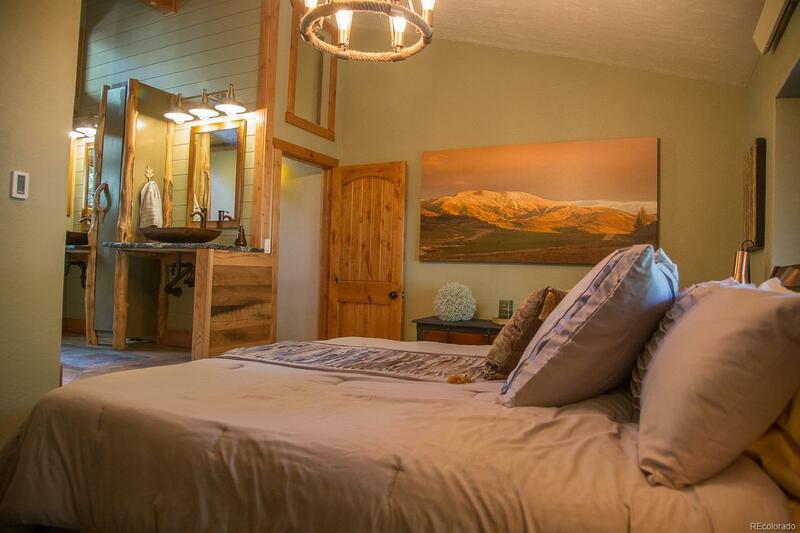 Sit back in your new soaking tub and watch the stars through 16 foot windows in the midst of towering pines and aspen. Enjoy a fire in the ethanol fireplace. If showering is your preference then you will enjoy the rainfall/waterfall shower with 6 body jets. If warming up after a day of skiing is wanted then you will enjoy your new infrared sauna. The suite is complete with a walk in cedar closet with washer /dryer. The two sink vanity has hand blown glass sinks.The kitchen is appointed with soapstone counter tops, stainless appliances, hand blown glass light fixtures and slate flooring.New copper hand rails lead to the lower level master suite with hand blown glass sinks, cedar closet, steam shower and washer/dryer.